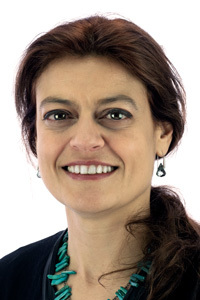 Rita Sousa-Nunes has a degree in Biochemistry (University of Lisbon) and a PhD in Developmental Biology (University College London). During her PhD she worked on early patterning of vertebrate embryos using mouse and zebrafish models, in the laboratories of Dr Rosa Beddington and Dr Derek Stemple (National Institute for Medical Research). Her post-doctoral work applied the power of fly genetics to distinct questions in neural stem cell biology: asymmetric division and reactivation from quiescence, in the laboratories of Professor William Chia (King’s College London and Temasek Lifesciences Laboratory, Singapore) and Dr Alex Gould (back at the NIMR). She has obtained various studentships and fellowships and in 2011 won the UCL Neuroscience Domain Early Career Prize and an MRC Special Award. She started her independent research group in 2012 supported by a Cancer Research UK Career Development Fellowship working on mechanisms of neural tumourigenesis. She is on a tenure-track position at the Department for Developmental Neurobiology, King’s College London. Her lab employs Drosophila and mammalian cells as models to understand neurogenesis and early steps in brain cancer formation.